The first indicator of declining wellbeing is the ability to cut your own toenails. That’s a conclusion of ongoing research in the Newcastle University Institute of Ageing. They identified fifteen key indicators as people’s capability reduces in the last ten years of life. Two scenarios are shown on the chart below. The left hand side is a typical steady decline over seven years. 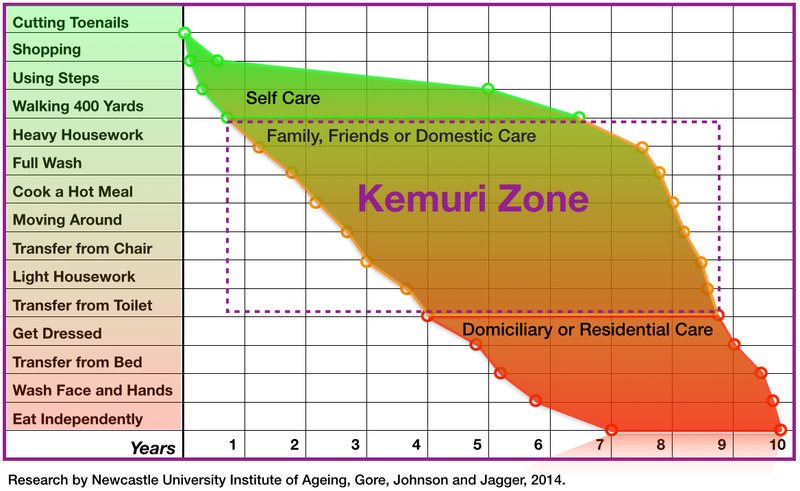 The right hand side is an optimally managed end-of-life curve. Perceived wellbeing is higher for six years before an inevitable decline and the need for professional domiciliary or residential care services. Quarkside was surprised that maintaining the ability to walk 400 yards for six years could increase lifespan by almost three years. Furthermore, the period of reduced capability is shorted, resulting in lower costs for end-of-life care.